As Ravelry said, it's that time of year, when the temperatures start to warm and things start to thaw out. It's a time of transition and change, growth and new things. We agree with them that one of our favorite transition pieces to wear is a shawl. It is easy to bring along, and makes you look stylish while keeping you warm when the wind picks up or the nights are still cool. 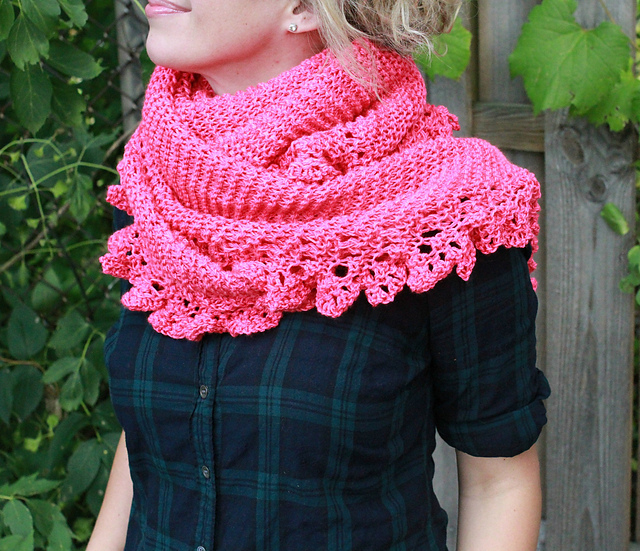 It's also a great project to make for spring- simple yet stunning, easy to take in the car or to a knit night. 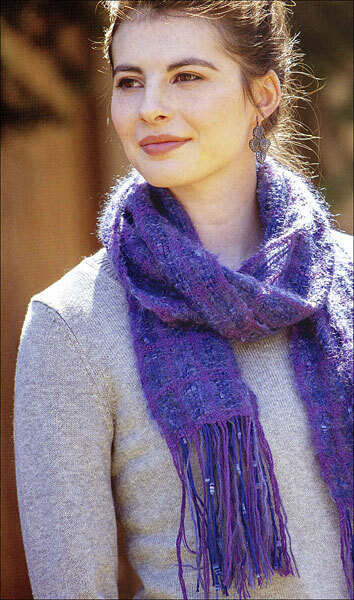 We will feature several shawl patterns, and gorgeous yarns to go with them in the pattern section of the newsletter. Speaking of new things, The Fiber Event is almost here! This two day event in Greencastle, IN (April 17th &18th) is free to attend, with free parking. It's a great place to try out a variety of spinning wheels, new classes, and see new things. It's a fun time, and worth the drive! It's block number 4 for the Building Blocks Afghan- Simple Decreases. If you have any struggles, stop by and we will help you out. Our next free "class" is Saturday, April 11 from 12-1pm. 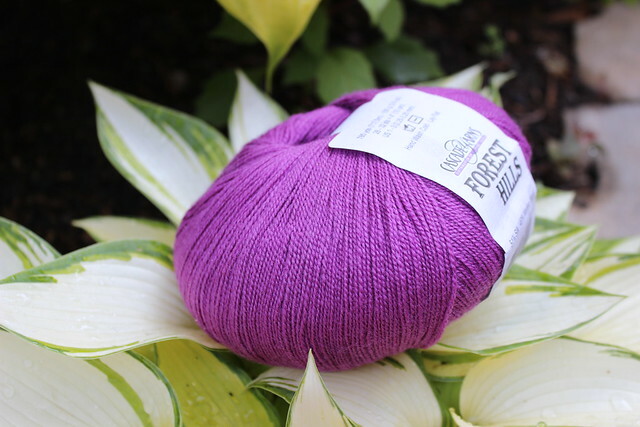 This shiny, worsted weight yarn is perfect for your spring projects. 50 grams and 125 yards, and 58% Rayon 42% Cotton. 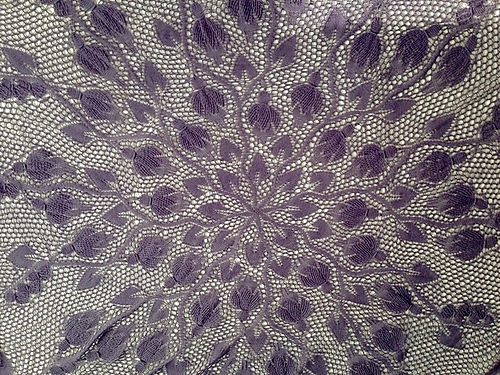 This lovely cotton is in store and ready to go! 100 grams and 208 yards; 100% classic cotton. This lace weight yarn has high shine and drape. 100 grams and 785 yards; 51% Silk and 49% Merino. Super soft against your skin! Sateenkaari is a top-down crescent shaped shawl with stripes. 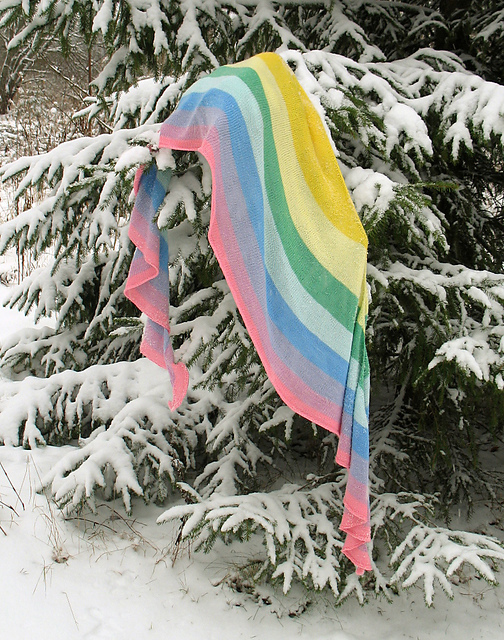 It's designed for eight colors, but you can knit it using fewer colors and either stop earlier or knit wider stripes. You can also hold two strands of lace weight together and create your own Ombre effect. 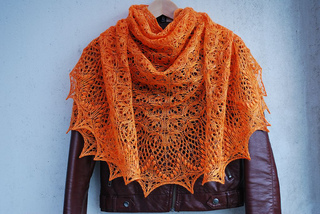 This shawl was inspired by Estonian lace and uses the blossom stitch. 440-880 yards of lace weight yarn and size 5 needles. This light an airy shawl is a stylish piece for your spring wardrobe. This stitch pattern looks complex but is actually deceptively simple, and can be easily adapted to any width or length by just changing the number of repeats. 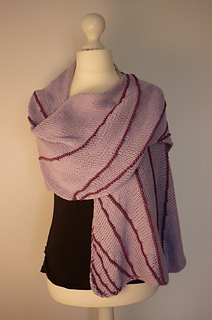 The silk yarn is both affordable and weighty enough to give the shawl a beautiful drape. 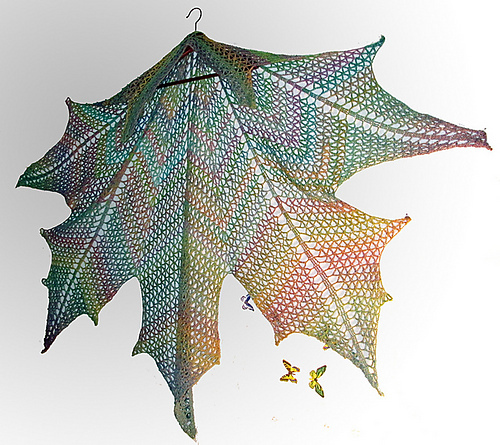 Inspired by the beautiful maple tree leaves so prevalent in the fall, this shawl will be a stunning addition to your springwardrobe. It can be made in any fngering weight yarn, but those with a high wool content will be best since it needs to be blocked aggressively. Suitable for intermediate and advanced crocheters. 1000yds, size 3.0mm Hook. 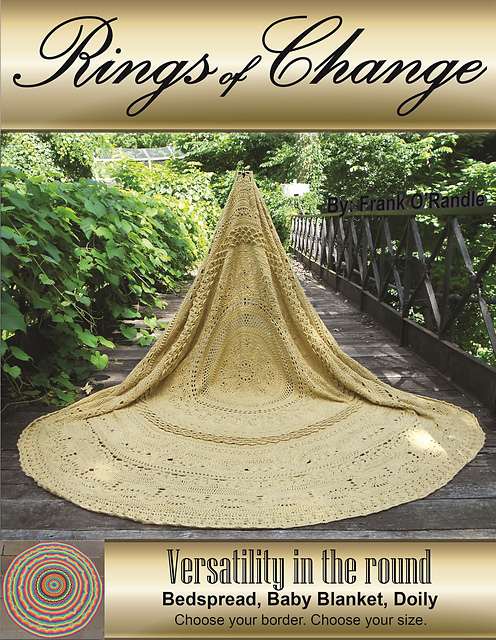 Rings of Change is a very versatile pattern that can be made in any size. 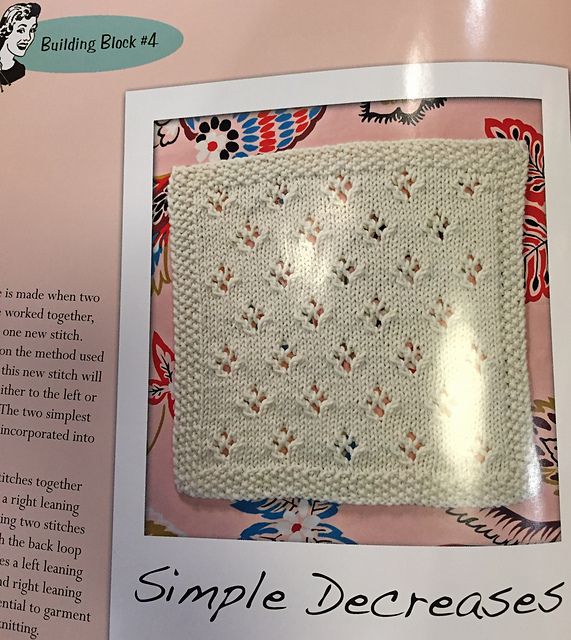 You can stop on any row of your choosing to make this any size that you want and have any one of countless styles of border. This pattern uses 33 different stitches and stitch patterns with no pattern repeating once it has been used once. Three different yarns are used in this highly textured luxurious scarf, but it's still just plain weave! They are a fine lace weight silk/merino, a fuzzy mohair, and a cotton tape. You will warp this intentionally skipping pairs of slots and holes, to allow the warp yarn to breathe and contribute to the soft drape of the finished scarf. This fabric will be quite open on the loom as you weave. The skill here is to vary your ppi (picks per inch), and you do so by changing your beating. The finer weft is packed in at 12 ppi, and the fuzzy mohair at 6 ppi. Together, these yarn create a delightful windowpane effect- and a great accent piece to any outfit. New to weaving? Want one-on-one instruction? Sign-up for a class! One of the most unusual fiber forms available to handspinners today is a glistening web of silk filaments that has been stretched into either a mawata square (hankie) or a cap shape. Mawata is a Japanese word that loosely translated means expanded cocoon. Hankies and caps are made most commonly from Bombyx silk cocoons that are not suitable for the reeling process. Excellent website about silk here. New to Spinning? Want a lesson on this technique or a lesson dying the natural silk? Sign-up for for a wheel spinning or dye class! The Fine Print: All classes must be paid in full at time of registration. If you give us at least 7 days notice of cancellation, we can give you a full refund. With at least 24 hours notice, you can transfer your registration to a different class. Less than 24 hours notice for cancellation will result in forfeit of your fee (we still have to pay our instructors for showing up). Unless noted, materials are not provided in the cost of the class. You will receive 10% off all supplies purchased on the day of class. Have you learned the basics of crochet? 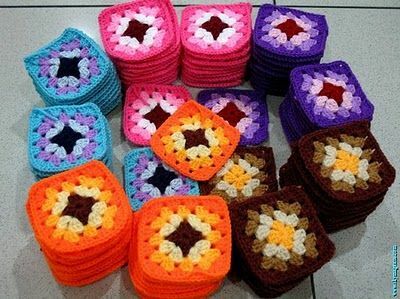 Come learn double crochet and crochet in the round while making the versatile Granny Square! Granny Squares can be joined to make scarves, purses, afghans, pillows, and many other fun projects! Please bring 3 colors of worsted weight yarn, a size I or H crochet hook, a stitch marker, a large eyed blunt needle, and scissors. In this 3 hour class, you will learn all the socks skills you need by completing a miniature sock. You will learn Judy's Magic Cast on, Toe increases, Short-Row Heels, and Jenny's Stretchy Bind-off. Materials: Please bring size 8 circular needles (32 or 40"), and worsted weight yarn. In this 2 hour class, you will learn how to create your own yarn in thin air! You will get a crash course in fiber, drafting techniques, and you will leave with your own, one-of-a- kind handspun yarn. Materials: You will be given 2oz of fiber and a student drop spindle that you get to keep! In this 2 hour class, you will learn how to dye yarn using kool-aid. We will touch on color theory, dye baths, microwave skills, and how to dye to get the yarn you want! Materials:1 skein of yarn and dyes included. Please bring a zip-lock bag and wear old clothes. Beginning classes are offered EVERY Saturd ay from 9-10 am. We will teach you to start and end your work, as well as the knit stitch or how to single crochet. Needles, hooks and yarn provided or bring your own! 1:1 classes for techniques, advanced stitches, or pattern help is also available for $10/hour. In this 2 hour lesson, you will learn the basics of how to make your own yarn. Spinning lessons are offered 1:1 or as a group. Wheels are provided, or bring your own. You will also receive 2 oz of spinning fiber . Lessons are by appointment only. We also offer 1:1 instruction to learn special techniques or to boost your skills.